Complaining about the content of a Wiki is moronic. If you do not like the content, expand the articles. Wikipedia doe's not have more information than the Wiki, it is that the Wiki is all about the Blood universe, not just one game. Can this disscusion become pratical again instead of lazy jerks complaing about content? Just thought I would mention something to encourage others to help put the Wiki. You do not have to worry about your work being deleted , the Wiki is ran by inclusionist and as such we are very reluctant to lose data. Also, I am proud to announce that after much work we are almost done makeing out List of Fan Fiction article. Still a little more work to be done, and I have a few more stories of my own to finish and upload. Morry wrote: I just noticed that all my work building a list of pop culture references on the Wiki page were deleted a while ago. You'll find it on the Blood page. I have copied all the good Wikipedia text into the wiki and worked on it extensively, I am quite proud of it particularly the fan fiction page. I wish the Caleb Wikipedia article was not deleted, there was some good text there. Whenever I see good text on Wikipedia I grab it and paste into and Open Office document for storage, in case the deletionists come knocking. Speaking of things being deleted, the Crudux Cruo fan site is no longer functioning. It was not that good a site but it is still sad to see a Blood thing die. Also during my internet searches I found this nice little flash game called Blood: The Flesh Game. Check it out! If you get stuck go see the Blood Wiki article on it, I have written a nice guide. You will find a link to the flash in the article. BREAKING NEWS: The Blood Wiki is now the offical host of the largest collection of Blood fan fiction ever written: The Tome of Blood. Come check it out! It would also be nice if someone would reply to this post so I know that I am not talking to a silent room. You'll know by how many views this thread gets. Slink wrote: You'll know by how many views this thread gets. Also are you the same Slink as who wrote the poem "Guy in a Trench Coat"? Out of all the Blood fandom, the Fan Fiction is my favorite. No offense to Transfusion of course. Yes that is me. I wrote that in 8th grade. Heheh, kinda corny. I've read some of your Tome of blood Giddy. It's good considering how difficult ultra-short fiction is to write. The flesh game has been played by many, although I never got all the way through it and would love to have another go. Zardoz wrote: I've read some of your Tome of blood Giddy. It's good considering how difficult ultra-short fiction is to write. It was a tradition for User:Tchernobog to write a Blood fan fic ever night for a while, with me as head editor, that is how the Tome was compiled. Me and him have always found long fiction writing difficult, the shorts are easy. Though Tchernobog is trying to come up with an idea for a long Blood story. I am also thinking of writing a few pieces of fan fiction. Any new writers are welcome to send their works to us, we will even host it! If you ever get stuck in The Flesh Game, simply read the story and areas section on the Wiki and all will be revealed. That Hedge Maze is so hard! Sorry about my various grammar mistakes though. I will go through them all and do some revisions some day. Thanks for the compliment though. Anyway I come with a simple request. Could you please contact your webmaster and place in a humble little Blood Wiki link beside the ones for such sites as The Postmortem and Planet Blood. 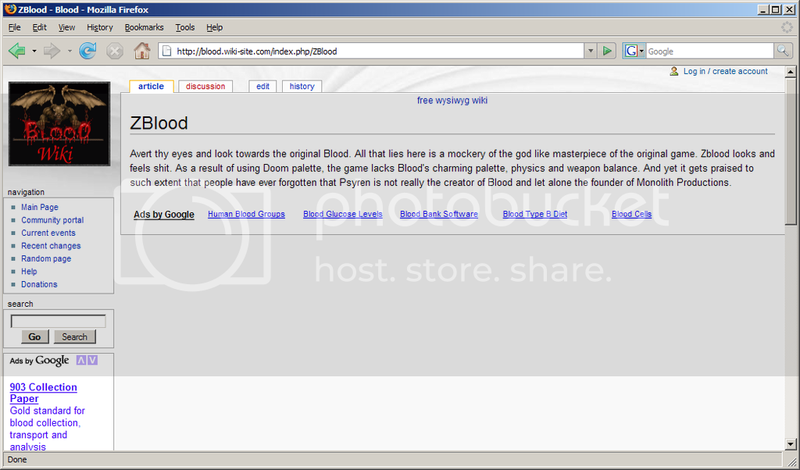 We had our first Vandal, the ZBlood page was edited to express a negative opinion. We have banned the vanadal (User:Krypto). If we banned the wrong person, please contanct the Wiki staff. If you were the vandal though you deserve the ban. NOTE: If you want to express an opinoin on your Wiki, you can have it on your User Page but that is it. Haha not surprising, although it's odd you banned me considering i edited what was for the most part my own work. I've seen the light for what ZBlood really is, infact let everyone share in the knowledge. Now, now no need for arguments to spark as a result. You know how a neutral description should be? !